The Agile Fluency Model™ was designed by some of the Agile industries stalwarts, including James Shore and Diane Larsen. We love this model – it overcomes some of the challenges of other assessment tools. There is a focus on ‘Becoming Agile” over “Doing Agile”. The team provides the data, which means no one is filtering responses though how teams “should be acting”. It is a short assessment – around two hours per team. The focus is on Value – which should be the goal. It is model and framework agnostic. It takes a systems view. 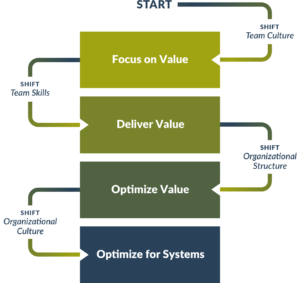 Diana Larsen and James Shore published the first article about the Agile Fluency Model in 2012. The model grew from their collective experience working with many agile teams. They refined the model through collaboration with skilled practitioners and with advice from other leading thinkers in the agile community. In November 2016, Jenny became one of first “class” of facilitators for Agile Fluency Model. Please let us know if you would like to talk about an assessment for your team.